Ask 10 patients who take medications (chemical drugs) for their chronic conditions, and 9 will tell you that they are not CURED. Still, they have to continue doing it because they have no other CHOICE. Chronic body conditions include: diabetes, hypertension, migraine, acidic stomach, joint pains, constipation, depression, cold & flu, and so forth. Reasons for this malady are straight forward. 1. Drugs are made from chemicals. They are inorganic – meaning VOID of life and cannot sustain life itself. On the other hand, carrot & spinach juices combined, is organic – together, they heal the ailing stomach, offering copious vitamins, minerals, phytochemicals, and enzymes to rebuild the body. 2. Another example is inorganic sulphur compound. It is outright poison for the human body. On the other hand, sulphur from onions, garlic, cabbage, watercress, etc is highly beneficial. The same goes for inorganic iodine, and ORGANIC iodine found in kelp and sea vegetables. 3. Drugs are designed to relieve symptoms or diseases. In this modern world, there are more than 60,000 classified diseases, and each disease is “covered” or relieved by a drug or more. As long as the CAUSE of a disease is not identified and seriously studied, we will continue to chase symptoms and use inorganic compounds called DRUGS. Have you ever wondered WHY it shares the same spelling as Narcotic Drugs? 4. When chemicals are ingested into our body system, they are circulated 3.000 – 4,000 times per day throughout the body via the 100,000 km blood vessels (arteries and veins). A lot of damages can be done to major organs such as liver, kidneys, heart, blood vessels, and the brain. In fact, the first organ to be harmed is the old faithful stomach. 5. 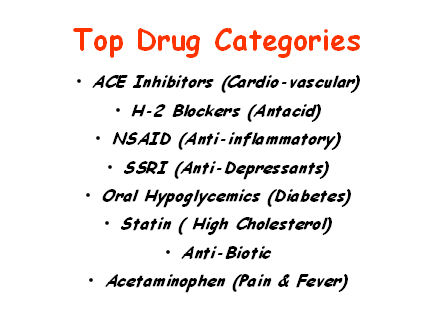 The TOP Drug Categories are given in the table above. And each category consists of a number or types of drugs. For example, under the ANTI-INFLAMMATORY category, we may have Vioxx, Celebrex, Bextra, and so forth. The scary fact is that VIOXX was withdrawn in September, 2004 because it caused heart problems to many patients. And during its ten year reign in the market place, it had brought in USD30 billion to its creator Merck (pharmaceutical company). Another scary fact is this: ONE out of FIVE prescription drugs is withdrawn over time due to some intolerable risk factors they pose to regular users. Now 1 over 5 is 20% !! Would You Bet Your Life On Chemical Drugs? ?